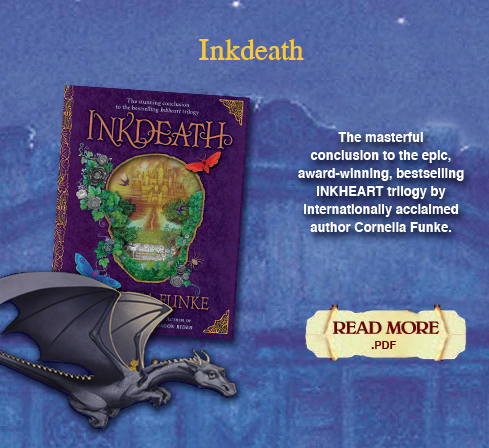 Chapter 1 from INKDEATH by Cornelia Funke—Original text © 2007 by Dressler Verlag—English translation © 2008 by Anthea Bell—Cover, map and chapter-head illustrations © by Carol Lawson—Chapter-ending illustrations © 2007 by Cornelia Funke. Published by Chicken House, an imprint of Scholastic Inc. All rights reserved. Check out a new exclusive interview with Cornelia Funke! Listen to her describe her evolution as an author, watch her give a tour of her house, and see how many ideas she has for new books! Inkheart is movie! It stars Brendan Fraser as Mo, Andy Serkis as Capricorn, Eliza Bennett as Meggie, and Paul Bettany as Dustfinger. Coming to theatres January 30, 2009!